Coutinho has not been his best at Camp Nou, and Liverpool should think about taking him back. It has been a sad experience for the Brazilian in Camp Nou. Ever since Phillipe Coutinho made the 142 million euro move to Spain, he has not been able to reach expectations, much less exceed them. When he made the switch to his dream club, everyone thought he would become the Blaugrana's next Andres Iniesta. He didn't, he hasn't, and quite frankly, he won't. The 26-year-old didn't achieve the consistency required of him, and he lost his place in the first team to Osumane Dembele. Even after scoring against Lyon in the last Champions League round of 16, Coutinho isn't first team material at Barcelona. After giving Coutinho 32 starts in the last 14 months, its time for Barca to cut their losses. 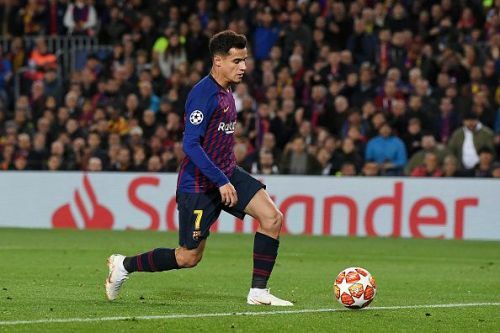 According to Goal, The Camp Nou office has decided to hear offers for Coutinho with the price tag sitting at around 80 million Euros (which is a downgrade from the initial 120 million they paid for him). While Barca will never offer Coutinho to Real Madrid, PSG and Old Trafford make for probable destinations for the Brazilian star. Because of his wage demands, his options are quite limited to very top clubs who may not necessarily be looking to buy. Liverpool's ex no. 10 stayed with the Reds for 5 years, and in that time, produced scintillating performances, became a pivotal player on the team, and put his name in the mouths of every Liverpool fan. In just over 200 appearances, Coutinho had scored 54 goals. He was (and could still be) a phenomenal player for Anfield. Currently, Liverpool are at the top of the EPL, with City putting up a strong title defence. They have also reached the quarterfinals of the UEFA Champions League, where they look to progress past FC Porto. In the minds of fans and pundits, Liverpool have exceeded expectations. They might not win any of the available titles, which is fine, but they can plan for a certain win come 2019/2020. Coutinho would be just the person to enhance that possibility. Liverpool have done tremendously well in the transfer market over the last few seasons. They have formed master attacking triplets in goal scoring form, and have brought in a reliable defence structure. Yet, the midfield still needs a very bright spark, and that spark could very well be the man they sold off a year ago. The fans and the club alike recognize Coutinho's ability. They watched him match after match as he brought creativity and goals to Liverpool. They know that Coutinho has what it takes to provide the front three with all the assists they need. Coutinho is a world-class player. More importantly, he's Liverpool's world-class player. I say let bygones be bygones and forget all that's happened in the past. Bring the former number 10 back to where he belongs, and Liverpool will be near unstoppable by 2020. It's very unlikely that Barcelona might sell Coutinho back to Liverpool. The Blaugrana are a proud club, and the error of spending so much on the Brazilian most certainly hurts. To sell him back at a lower price to the club they bought him from would be a slap on the face. But Liverpool is where Coutinho belongs!